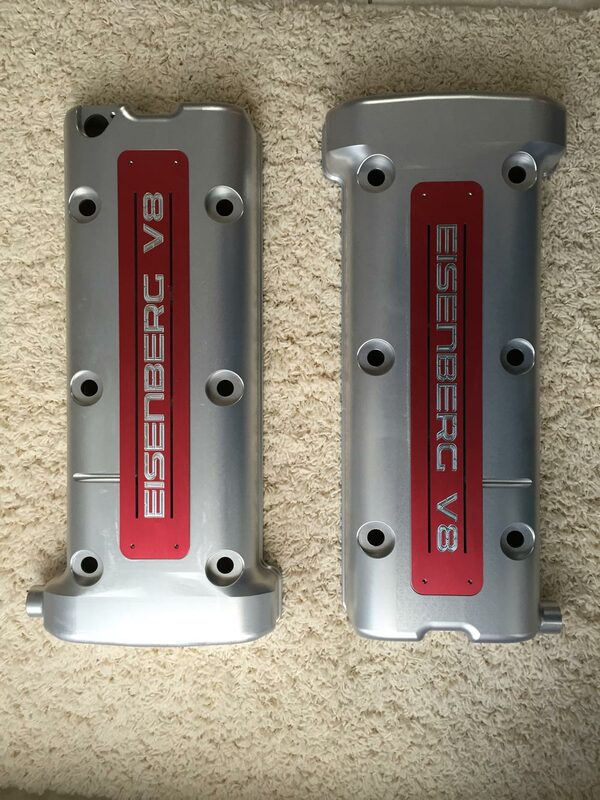 EISENBERG V8 | Eisenberg Racing - Max Your Life. The ‘EISENBERG V8′ – Possibly the world’s most extreme motorbike ever made. Imagine a motorbike with a V8 engine in, not a large big chevy car based V8, but a specially designed motorbike V8, producing over 450hp, weighing just 80kg and reving to 11,000 rpm, all in a compact chasis and wheel base no bigger than a normal 1200cc muscle bike. That’s right – multiple Land speed record holder Zef Eisenberg, along with the engineering team behind his MADMAX land speed race team, have pushed the boundaries of madness, by creating a very extreme V8 to create the worlds most powerful and lightest ‘production’ V8 motorbike ever made. This is not a race bike with silly loud exhaust, 10ft long wheel base or just made for Bonneville. This is the real deal, a bike that no one thought was possible. And it’s oozing high tech throughout, with the very best in marzocchi BSB race forks, Brembo brakes, discs and a specially designed Quaiffe counter rotating 5 speed gearbox and clutch to offset the centrifugal forces of the engine. Coupled with advanced Motec electronics and full TFT screen, the bike comes with a quick shifter, blipper and hydraulic servo assisted clutch, to allow this incredible V8 bike to be ridden as smoothly as you want, to collect the milk and newspaper. 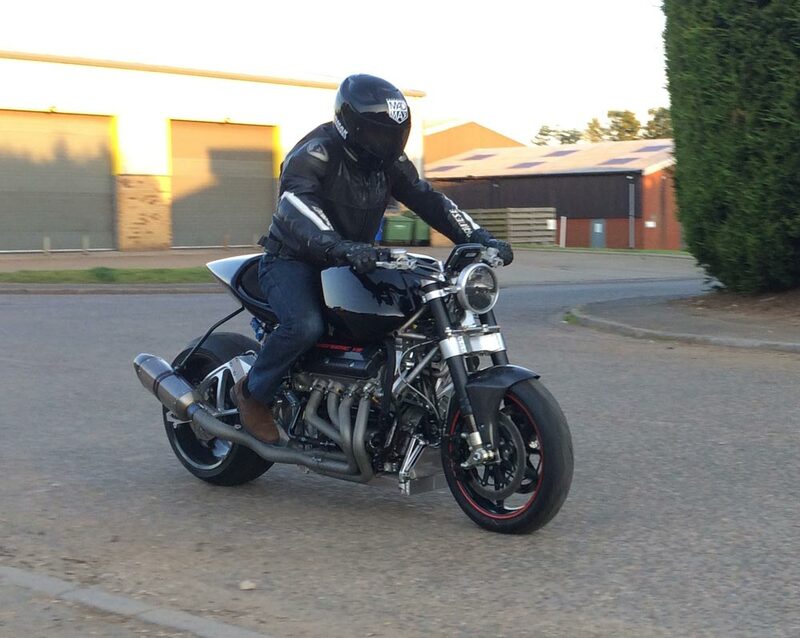 Alternatively this is a bike you can ride straight to the nearest airfield to set records for aspirated motorbikes. …and that’s no joke. 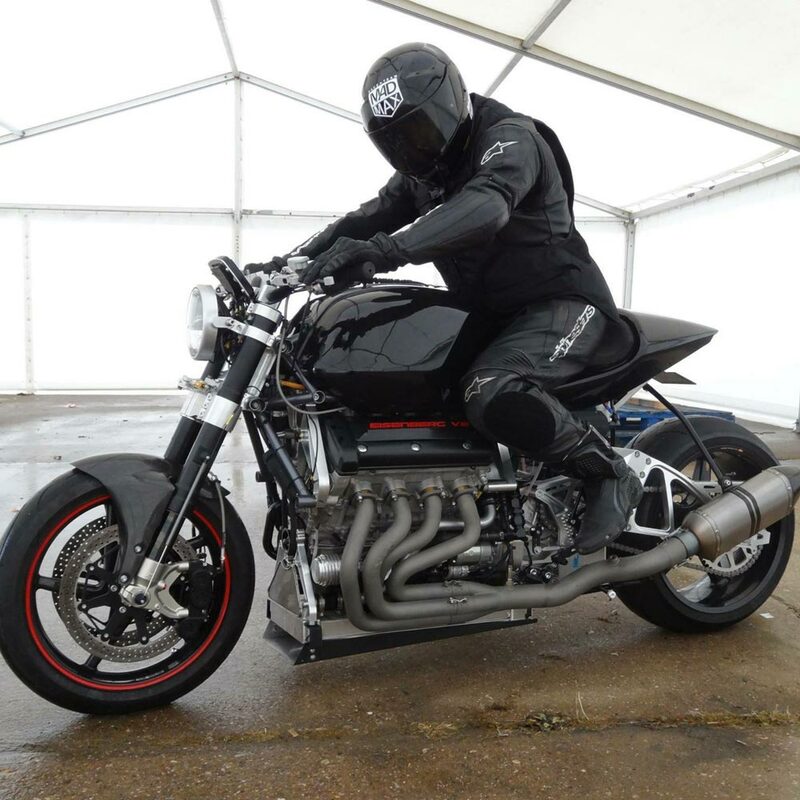 On its first test run at Elvington at the Straightliners event, the bike in competition achieved 207mph in a standing mile, running the engine in and without exceeding 8,500rpm. It redlines at 11,000rpm. That 207 mph was under certified timing conditions with no fairing and upright bars! proving real speed in the real world – not the fictitious speeds of an OEM bike or super car brand. The bike was ridden by the founder and creator of the motorbike himself, Zef Eisenberg, to demonstrate its safety. The unique V8 engine has been designed in conjunction with V8 and motorbike expert Ted Hurrell, the man that developed the RPE V8 engine for Radical. The V8 engine only weighs 82kg and is capable of producing 500hp in race spec at 10,500rpm. 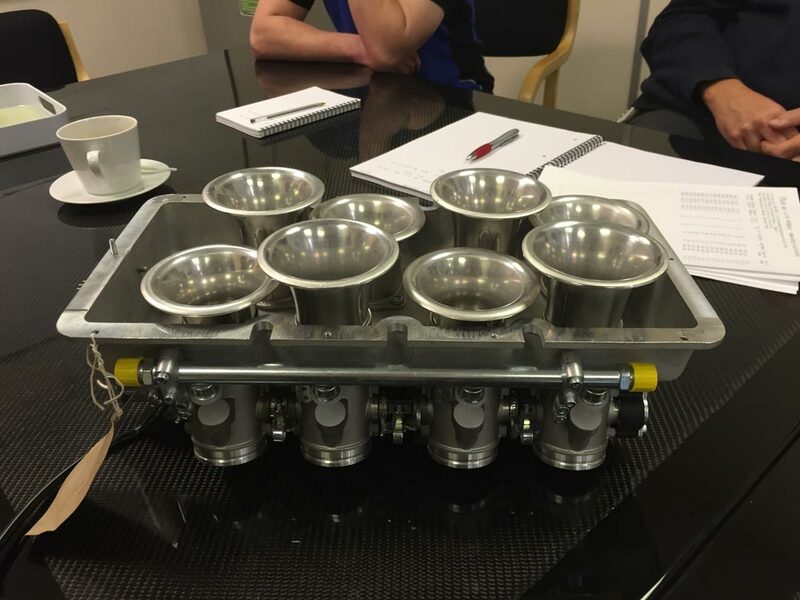 The production version will be a little less power, as it will be designed to run on regular and super unleaded. The V8 engine has been extensively worked on to fit within the very tight packaging of a motorbike, as opposed to an American car or some 1500 lb American monster cruiser bike with ‘strange’ handling. This bike has been designed without limitations or budget to create a genuine modern day muscle bike, with ‘normal’ weight, length and height. Prototype photos below (Expect lots of little tweaks to enhance the beauty of the bike). So, how did we package such a small V8 into a motorbike? 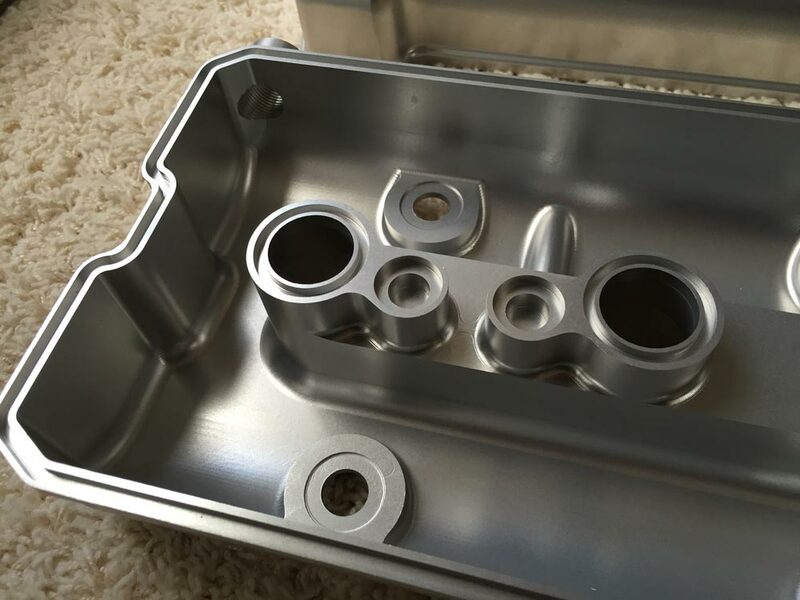 Most car V8’s, the ones you associate with ‘American muscle cars’ are a simple crossplane crankshaft design, which gives the typical ‘chevy v8′ burble, due to it’s uneven exhaust pulses. They are also much heavier and bulky by design. True light weight race bred V8’s generally have a flatplane crankshaft, which gives perfectly even exhaust pulses – like a Ferrari V8. Flatplane V8’s can rev much higher and easier (often double that of your typical burbly Chevy V8), meaning more HP from less cc (torque x rpm)/5252 = HP. Flatplane V8’s don’t burble, they scream, like an F1 car or Ferrari (also flatplane V8). A flatplane V8 is a more freely revving engine which is lighter, smaller and better primary balanced. But we didn’t stop there. 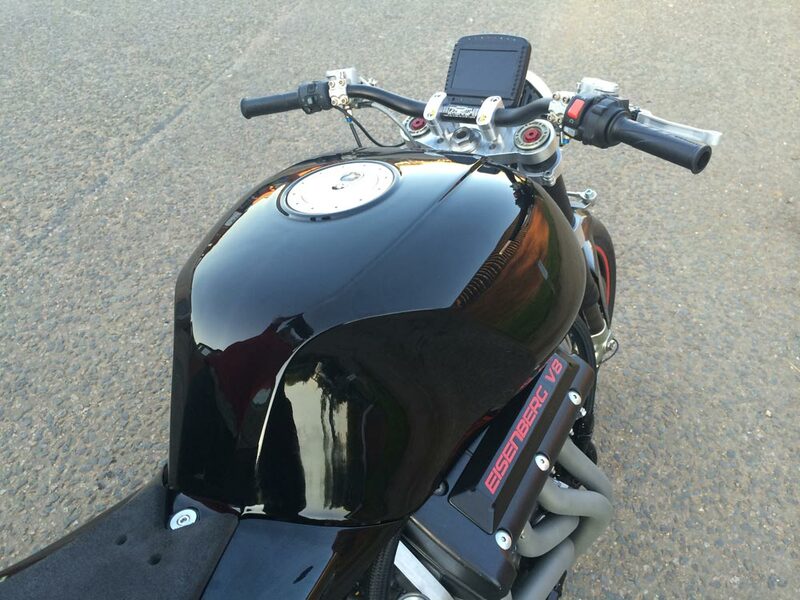 To make it sound really great, the bike is fitted with eight independent throttle bodies with tuned trumpet lengths to give the best possible airflow and throttle response, which is essential for a highly responsive motorbike. We are also working with the best in the business to create the best alternator, starter motor and small high cold cranking amp lithium battery to support this high compression engine machine, as an 11,000rpm engine with this level of current requirements is very rare. The project has been 4 years in the making so far, with lots of challenges encountered along the way, far more than any of the team had thought. Everything on the bike had to be designed and made from scratch, especially with such extreme levels of ‘every day’ power. The gearbox has taken over 2 years of designing and is now fully built, dyno tested and fitted (and patent pending.) It is a very small compact gearbox offering 5 speeds, swappable primary gears like a GP race bike, counteracts gyroscopic inertia, and features a very rare concentric swing arm design causing no chain tension problems, as proven on the world record MADMAX Turbine bike. This allows a smaller low friction 530 chain to be used and not a far heavier 630 chain that would cause more HP loss and friction. 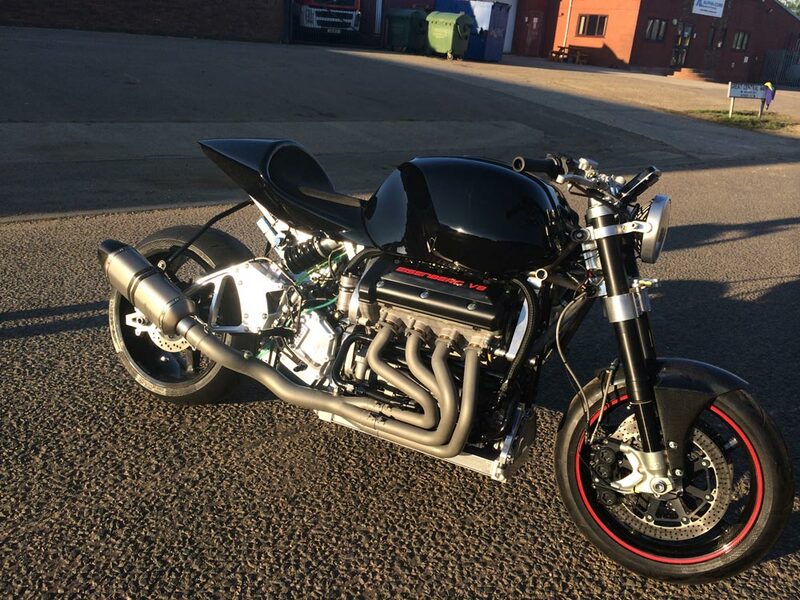 The bike will achieve its amazing power without any nitrous or turbo, but be naturally aspirated and will breathe through 8 independent race throttle bodies, controlled by a bespoke Motec ECU offering full ‘ride by wire’, thus allowing ‘regular’ riders to feel the awesome power of the bike without it spitting them off. Expect top speed and acceleration to be mind blowing and like nothing experienced outside of the best land speed racing or quarter mile bikes, yet at the ‘flick of a button’, be friendly enough to ride in town or the rain. For very experienced riders, there will be a special red key, that when switched on, will allow full control of the bike without electronic intervention for insane acceleration and top speed. The bike is being built in Guernsey, using our own experienced and highly professional team and expert consultants. 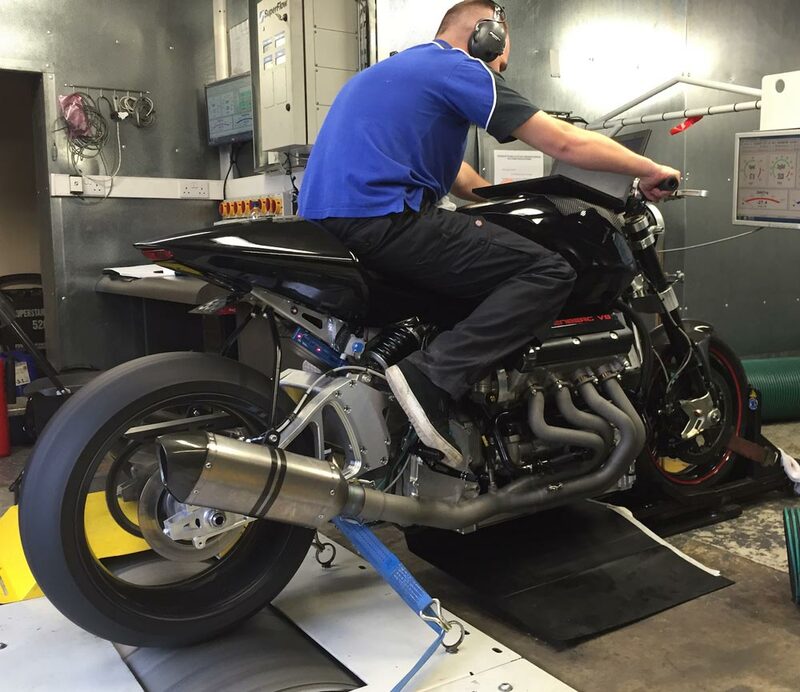 The test bike is under going continuous testing on the dyno and secret roads to ensure the production bike is fit for purpose, especially in terms of clutch feel, handling, gearbox smoothness, ride-ability, engine cooling, etc…. 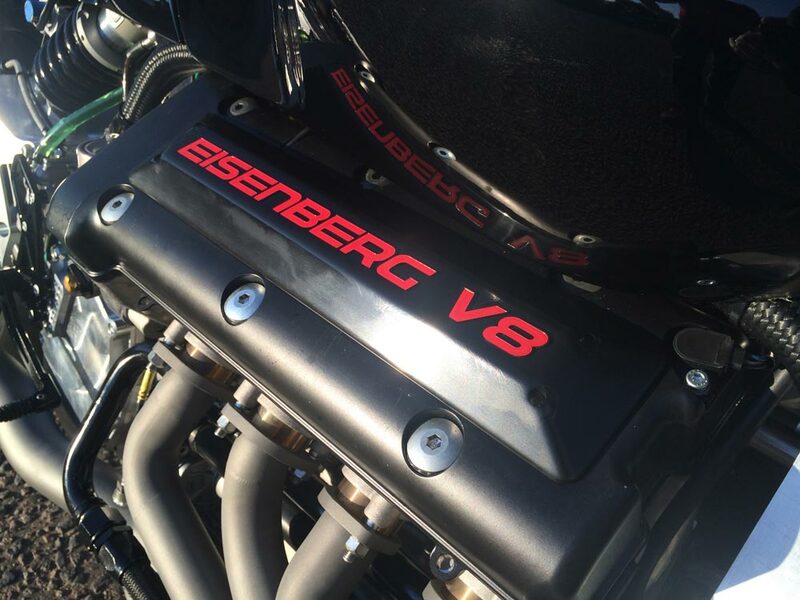 The Eisenberg V8 with Rider Zef Eisenberg achieved 207mph in its first run at Elvington, Yorks, with the engine still being run in (8500rpm max). The rest of the weekend, the bike performed many more runs, without issues. It was very well received, and the engine sound went down a treat. Over the the summer of 2016, the bike is being converted into generation 2 (race to production prototype), with many changes and tweaks to the mechanical side and plumbing (water and oil cooling) to ensure that the bike is more than just a ‘race’ bike, but a comfortable, easy to ride motorbike that can stay cool within traffic, smooth easy clutch, smooth gearbox, excellent electronics to ensure a comfortable ride and safety. Note: MADMAX and EISENBERG are registered trademark held by Maxicorp Ltd, with the UK and EU patent office across numerous classes.